The bad timing highlights Kyrgyzstan’s need to complete other energy projects. 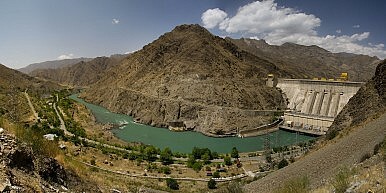 Just as Kyrgyzstan looks to find new partners for long-time uncompleted hydropower projects, one of the country’s key hydropower dams experienced serious technical difficulties. Aibek Kaliev, the deputy minister of economy, announced at a press conference Tuesday that three generators at the Toktogul dam had been disconnected after experiencing oil leakage from cables. As reported by 24.kg, Kaliev said the cables were installed 40 years ago. The shutdown of the three generators came days after a separate emergency outage. With four turbines capable of generating 1,200 MW, Toktogul is Kyrgyzstan’s largest power plant. With three of the turbines out of commission, Kaliev said, “Electricity supply is limited at the level of 235 megawatt-hours in Chui, Issyk-Kul, Naryn, Osh, Jalal-Abad regions, and Bishkek.” He noted that repairs could take two to three weeks. The timing underscores the importance of making progress on Bishkek’s various other energy-generation projects, which have been in planning or in progress for years. In addition, it throws yet another another shadow on the much-discussed CASA-1000 scheme, which envisions exporting electricity from Kyrgyzstan and Tajikistan to South Asia. In August, as Eurasianet reported, Kyrgyzstan inaugurated a power transmission line to move electricity from the country’s north to the south without passing through Uzbekistan — as Soviet-era infrastructure does. President Almazbek Atambayev was ecstatic with his praise, saying “Kyrgyzstan has secured energy independence.” While not false, in the sense that the power line allowed Kyrgyzstan to move electricity independently within its own borders, the statement wasn’t quite true, as the recent trouble demonstrates. Kyrgyzstan is far from energy independent but such a goal should not be far from the minds of Kyrgyz leaders as they enter 2016. Kaliev also said at the press conference that “the only source of electricity imports for Kyrgyzstan is Kazakhstan” and that Bishkek would be examining the possibility and logistics of purchasing additional electricity from Astana — but would need to figure out the technical aspects of transmitting it to the south. Kazakhstan has routinely supplied northern Kyrgyzstan with electricity during the summer, according to Asia-Plus, at a rate of 7.0 cents per kWh; meanwhile Tajikistan supplied the country’s south. Restrictions on electricity usage and scheduled blackouts are likely, according to Kaliev, because of Toktogul’s reduced output. But, he said, blackouts would be limited to one to two hours. It’s unfortunate timing, also, that Toktogul’s troubles came less than a month after Kaliev unveiled plans to renovate the systems at Toktogul in three phases over the next six years with funding from the Asian Development Bank (ADB) and the Eurasian Development Bank (EDB). The rehabilitation will cost upwards of $450 million. The electricity generation scheme has its big backers, but skepticism remains.